There, we said it — once for each decade since Tim Burton's quirky comedy-scarefest was released and, to Burton's surprise, became a cult classic. The 1988 movie, starring Pittsburgh native son Michael Keaton as "the ghost with the most, baby," had Burton doubting how he could sell it, or even describe it, to investors. 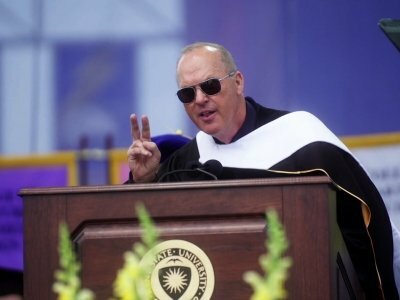 KENT, Ohio (AP) — Actor Michael Keaton is slated to give the commencement address at Ohio's Kent State University. Keaton enrolled at Kent State in 1971, intending to major in journalism and speech. He left school to pursue acting, landing appearances on "Mister Rogers' Neighborhood," ''Maude" and "The Mary Tyler Moore Show." His range of hit movies includes "Batman," ''Birdman" and "Spotlight." Keaton spoke at Kent State in 1985 and said then that he would like to return someday. 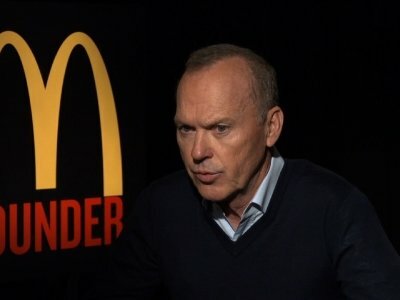 KENT, Ohio - Oscar-nominated actor Michael Keaton, who attended Kent State University in 1971, will return to campus May 12 to deliver the university-wide commencement address. Michael Keaton is narrating a 50th anniversary tribute to the late Fred Rogers and his beloved children's program, "Mister Rogers' Neighborhood." "Mister Rogers: It's You I Like" will air March 6 on PBS and includes celebrity admirers sharing their memories of the show that debuted Feb. 19, 1968. It remains one of the most iconic images of Sidney Crosby's career. With a steady snowfall blanketing Ralph Wilson Stadium, the Penguins captain slipped a shot past goalie Ryan Miller in the third and final round of a shootout to give his team a 2-1 victory over the Buffalo Sabres in the first NHL Winter Classic on Jan. 1, 2008. Once my eye stopped twitching after flashing back to Francisco Cabrera's hit, I could appreciate the scene. Former Pirate Sid Bream was at PNC Park Saturday afternoon. Yes, in Pirates jersey. Not a Braves one like the one he wore sliding across home plate to end Game 7 of the 1992 NLCS. 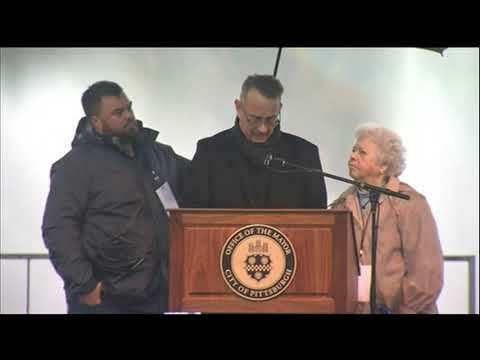 He was on stage with four Pirates players he helped eliminate that fateful October night: Bob Walk, Doug Drabek, Mike LaValliere and John Wehner. They go up against a rogue agent who went through Keaton's same training program and is now building a nuke. He's played by Taylor Kitsch from "Friday Night Lights". 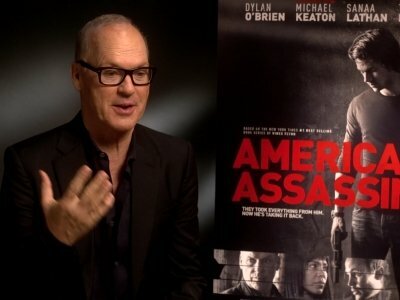 “American Assassin,” an action thriller based on a 2010 book by “24” consultant Vince Flynn, is no “American Sniper.” It’s a low-rent “Jason Bourne” about Mitch Rapp (Dylan O’Brien, “Teen Wolf”), a young American whose beautiful, bikini-clad fiancee, Katrina (Charlotte Vega), to whom he has just proposed via selfie cam on a beach in Ibiza, is shot to death by Muslim terrorists. Michael Keaton said Tim Burton's live-action remake of 'Dumbo' is "physically beautiful". The 66-year-old actor was announced by the filmmaker to be starring as V.A. Vandevere in Disney's upcoming live-action remake, and Keaton - who worked with Burton on 'Batman' - admitted it's different than anything the film producer has done before. LOS ANGELES — There are 16 Vince Flynn books about Mitch Rapp, who can be dubbed a post-9/11 Jack Ryan, and Friday’s “American Assassin” is the first to be filmed. Flynn, who in addition to his political thrillers also served as a “24” story consultant, died in 2013 after a three-year battle with prostate cancer. He was 47. Joseph Gatt has been cast in Tim Burton's live-action remake of the Disney animation 'Dumbo'. The 42-year-old 'Game of Thrones' actor will play a character named Skellig alongside Colin Farrell, Danny DeVito, Eva Green and Michael Keaton, Deadline reports. Michael Keaton is reportedly in talks to join the cast of Disney's live-action film 'Dumbo' as a villain. 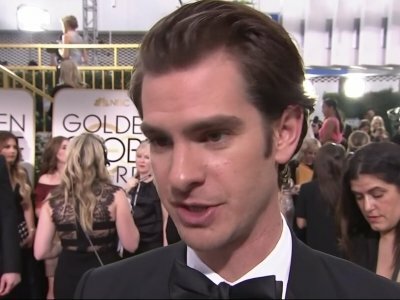 The 65-year-old American actor, producer-director, who received an Oscar nomination for his role in 2014's 'Birdman', is said to be involved in negotiations to join Eva Green and Danny DeVito alongside Colin Farrell. LAS VEGAS (AP) — Iron Man just put Spider-Man in time out. Smart Rating: 78.83Genre: dramaStarring: Michael Keaton, Kathy Baker, Morgan FreemanHotshot real estate salesman Daryl (Michael Keaton) has a bad cocaine habit. After embezzling his company's money, he wakes up next to a girl who overdosed. To hide from the police, he checks into a rehabilitation program guaranteeing anonymity. Under the mentorship of counselor Craig (Morgan Freeman), Daryl accepts that he has a substance abuse problem. As he falls in love with fellow patient Charlie (Kathy Baker), Daryl begins committing to a newly sober life. Smart Rating: 18.11Genre: Romantic ComedyStarring: Katie Holmes, Marc Blucas, Amerie RogersSamantha MacKenzie (Katie Holmes), the daughter of the president of the United States (Michael Keaton), arrives at college with a group of Secret Service agents. Samantha, however, resents their presence and decides she wants to attend school just like a normal student. Her father agrees to recall the agents but secretly assigns James (Marc Blucas), an undercover agent, to pose as a student. They fall in love, but their romance is jeopardized when Samantha learns James' true identity. MINNEAPOLIS (AP) — The late Minnesota author Vince Flynn's counterterrorism operative Mitch Rapp is coming to the big screen in September. 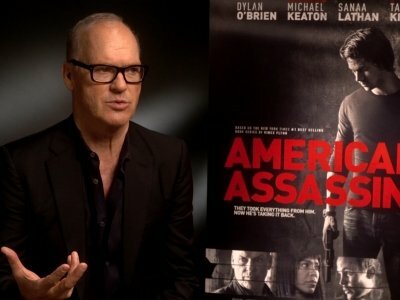 CBS Films and Lionsgate announced Wednesday that "American Assassin," based on Flynn's best-seller, will hit theaters Sept. 15 nationwide and in North America. SCOTTVILLE — West Shore Community College’s 50th anniversary classic Hollywood film series, in collaboration with Manistee’s Vogue Theater, continues on Feb. 14 , at 7:30 p.m., with the screening of the 1988 Tim Burton comedy fantasy “Beetlejuice” starring Geena Davis, Alec Baldwin, Michael Keaton, and Winona Ryder. Great businessman? Or big fat liar? You decide on Ray Kroc’s title as “The Founder” of McDonald’s. He didn’t come up with the idea. He didn’t invent the automated system at the restaurant that basically invented the concept of “fast-food” service. It wasn’t him who decided the focus would be on three items — burgers, fries and drinks. Ketchup, mustard, two pickles. 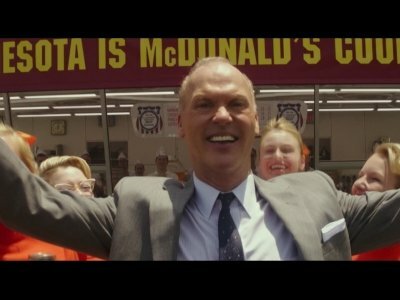 In John Lee Hancock's "The Founder," about Ray Kroc and the making of McDonald's, the ingredients for success are ruthlessly simple. 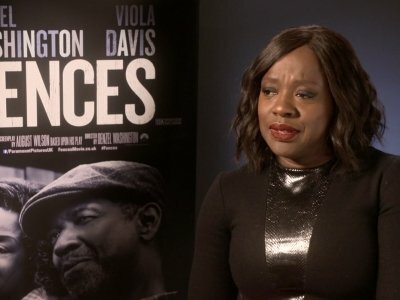 Will Viola Davis watch Trump’s inauguration? 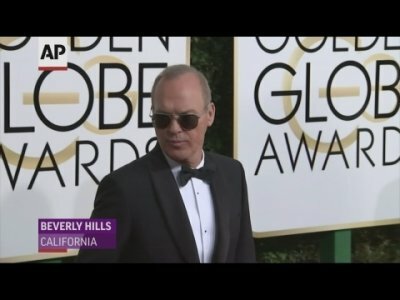 LOS ANGELES (AP) — Michael Keaton says anyone who reads something discriminatory into his Golden Globes garble of "Hidden Fences" is "extraordinarily incorrect." "I mean, almost like calling Al Gore a climate change denier," Keaton told The Associated Press on Wednesday. Keaton said he "made a mistake reading the teleprompter and the cue cards" when he conflated the titles of "Hidden Figures" and "Fences" at the awards ceremony Sunday. Both films have predominantly black casts. Twitter was the true winner of Sunday night's Golden Globe Awards. Bush Hager asked producer and composer Pharrell Williams about the movie he scored, "Hidden Figures." Problem was, she called it "Hidden Fences," combining the title with another critically acclaimed African-American film, which is also getting lots of awards-season buzz. LOS ANGELES (AP) — Michael Keaton has revealed the reason behind his departure from the "Batman" franchise after two films. Keaton starred as the superhero in 1989's "Batman" and 1992's "Batman Returns." Both of those films were directed by Tim Burton. Joel Schumacher was hired to direct 1995's "Batman Forever," and Keaton decided to pass on starring in that film. Smart Rating: 18.97Release year: 1998Starring: Michael Keaton, Kelly Preston, Mark AddyAs a touring musician clinging to dreams of stardom, aging rocker Jack Frost (Michael Keaton) never had much time for his wife, Gabby (Kelly Preston), and young son, Charlie (Joseph Cross). A year after Jack's tragic death in a car accident on Christmas Day, Charlie plays a mournful tune on his father's harmonica. Much to his surprise, the elder Frost is magically brought to life as a snowman on the family lawn. Given a second chance, Charlie and Jack struggle to make up for lost time. Michael Keaton is returning to his superhero roots, this time as a villain, in next year's Spider-man reboot. Marvel Studios president Kevin Feige confirmed in an interview with the Toronto Sun (http://bit.ly/2fSqBjB ) that Keaton will play Vulture in "Spider-man: Homecoming." All of a sudden, how the music looked seemed to be of far greater interest to people, as opposed to how it sounded, while we watched a limited number of MTV music videos recycled throughout any given day. Up until that time, wearing a gray sweatshirt cut away at the neckline to fall off one’s shoulder would have seemed preposterous, while ordering little pieces of fried chicken and readying oneself to dip those into a choice of sauce became a treat for all those who found delight in a McNugget. 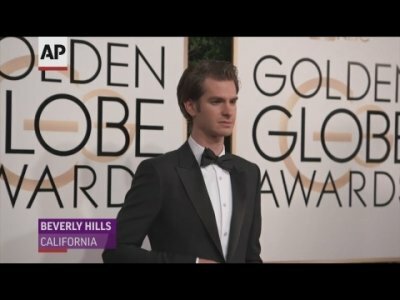 LOS ANGELES (AP) — Tom Holland swung into a children's hospital in his Spidey suit. The actor posted a photo of himself Thursday on Instagram smiling in costume at the Egleston Children's Hospital in Atlanta, where "Spider-Man: Homecoming" is currently in production. He debuted as the latest rendition of the web-slinger earlier this year in "Captain America: Civil War."